With a single "before and after" test, this handy device effectively demonstrates how your RO or distillation system eliminates harmful dissolved solids. It will also service test systems, including membrane evaluation programs. 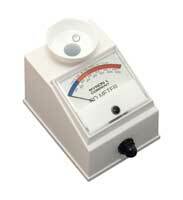 The Myron L® RO-1 Meter is easy to use and requires no special training. Simply pour the sample into the cell cup and press the button. ppm/TDS is immediately indicated on the color-coded scale (models without the color band dial are also available). No temperature adjustments are ever required! The graph at the right illustrates a TDS reading of a 500 ppm water sample tested with a non-temperature compensated conductivity meter. The same water sample appears to have a higher level of TDS when heated (and lower TDS when chilled). Actually, only conductivity readings change with temperature. Many instruments ignore the importance of temperature. 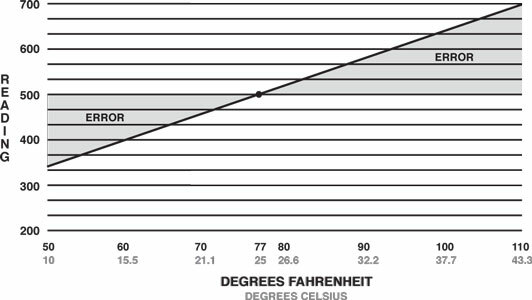 Others require a separate thermometer for testing sample temperature, then manual adjustment of the meter. All Myron L® instruments, however, feature fast and precise Automatic Temperature Compensation. The result: a more accurate, useful instrument. 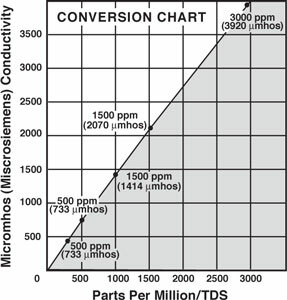 Total Dissolved Solids (TDS) conduct electricity. This conductivity allows measurement of the concentration of these salts directly in parts per million (ppm). However, the salts' composition in waters can vary significantly by location. Since various salts pass current differently, it was necessary to determine an "average" ppm/conductivity relationship. The Myron L® Company established the "442" Standard over 40 years ago. It remains the world’s most widely accepted standard of its kind. Myron L® offers instruments that check both TDS and pH, and are widely used throughout the RO industry. Are used to periodically recalibrate instruments for greatest accuracy. 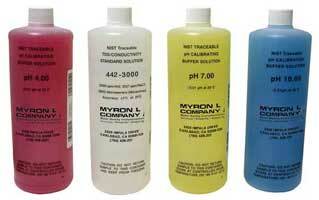 442-1000 (1000 ppm/TDS) is the type used in Myron L® factory calibrations. Carrying Case for use with all Myron L® DS/pDS portable instruments. Foam lined and molded of sturdy ABS plastic.